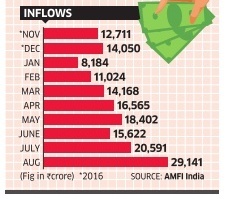 Home > OCT 2017 > Inflow in balanced Mutual Funds rises fourfold..! Balanced funds continue to remain the flavour of the season. Interest and inflow into balanced funds have continued to grow with the category seeing a fourfold jump in inflows in the first half of the current financial year. During April-September, balanced funds, which invest in a mix of debt and equity, witnessed inflow of Rs. 47,045 crore, against Rs. 11,828 crore in the corresponding period last year. This significant incremental flow pushed the overall assets under management (AUM) of balanced funds to nearly Rs. 1.35 lakh crore, against Rs. 84,800 crore in March. With markets trading at expensive valuations, many investors are opting for balanced schemes in order to avoid excessive risk. Average monthly inflows into balanced schemes have been around Rs. 8,000 crore. Mr. Mahesh Patil, Co - Chief investment officer, Aditya Birla Mutual Fund, said in the current scenario, investors should look at balanced funds. “I would say if someone has to put in a lump-sum amount, balanced funds with an in-built dynamic asset allocation process should be preferred." 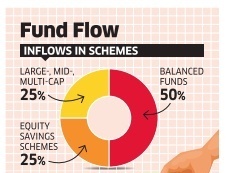 Mr. S Naren, CIO, ICICI Prudential Mutual Fund, has long been advising investors to increasingly look for dynamic asset allocation funds (balanced advantage funds). Almost all categories of balanced funds (also called hybrid funds) have offered reasonably better returns. For instance, category average returns of balanced funds, which are equity-oriented, were 12.2% in the past one year. Similarly, funds with an asset allocation strategy also managed to provide double-digit returns of 10.6% during the same period. At a time when bank deposit returns have been sharply cut with recurring deposits and fixed deposits offering about 6.5%, investors want returns which are at least 2-3% points more, without taking too many risks. Fund officials say that attraction towards balanced funds are here to stay and going forward it may only increase if banks cut down their deposit rates further.